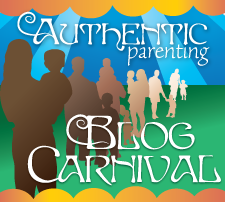 This post was written for inclusion in the monthly Authentic Parenting Blog Carnival hosted by Authentic Parenting and Living Peacefully with Children. This month our participants have written about authenticity through character, emotions, and establishing authentic communication with their children. We hope you enjoy this month's posts and consider joining us next month when we share about Honesty. Sometimes the words won't flow, they get stuck, trapped by an invisible gate or are jumbled up like a pile of clothes waiting to be washed. Sometimes the words are not there. There is nothing to say. I listen intently but I have no reply. Sometimes the words come fast. So fast they are tripping over each other. I stop listening and out they pour out one after the other. As a child, I have been told by my mother, I spoke little in my first school until about the age of ten. I have no memory of this, my memories of this school are good ones, I enjoyed my time there, I was allowed my silence, my quiet. Not so at my next school, I was not happy to be there with teachers who spent an hour a week with you, who needed you to speak, to hear your words to check your progress. I joined the workforce and loved my first job. I was valued, respected and trusted. I moved to another and hated it. I vowed I would never stay in a job which I did not enjoy, where I was not valued, respected and trusted. Now I am doing the most difficult, unpaid, job of my life as a mother. Never before have I been so bombarded with information and advice even when it has not been asked for. It has been hard to stop the flood, to dissect the words to find the ones that I want, to be a parent who is respected and trusted by my children and for my children to learn these important values. I know I can listen, but am I always present? Can I wait to hear what my child needs and wants to tell me, it's easy to stray, to have your mind elsewhere planning and thinking. I try to be mindful with my words, to speak as I would be spoken to, but sometimes those words flow out fast, without thought, they hurt and I apologise for I am wrong. I have to trust my children, to allow them to be themselves, so they can walk their own path not mine, they can lead not follow. I want the best for my children but I have to let them develop and learn at their pace, if I dictate the pace I am measuring them up to my standards. I am trying to foster respect and trust through love and kindness, not control. Remaining True To Yourself While Parenting - Authentic Parenting compares Western Child centered parenting with African parenting and discovers some ways to maintain your authenticity. Authenticity Through Emotions — Jennifer at Hybrid Rasta Mama shares her belief that being a truly authentic parent means allowing and supporting both her daughter’s emotions and her expression of them but also her (Jennifer's) own emotions. Isn't it so tough to just let our children development at their speed and not our expectations of their speed? Good for you for remembering that our jobs are parents are not to control but to peacefully, gently guide! That should have said 'Voices, not Vices' ! I love the proze of your writing here! I was just commenting on Mari's blog something along the lines of what you write: it's so easy to have a wandering mind when parenting... but t's so rewarding when we can be truly in the moment. I agree that mothering is the most difficult ( and exhausting) job ever. It is also the place where we learn the most. They are teaching me far more than I've taught them! It is a daily struggle for me to be mindful and present..good reminders. thank you!